The clock is ticking down to the final hour before the Apple fall keynote. There will be multiple things to look for… but most importantly: how well Tim Cook does. It’s a big day for Apple CEO Tim Cook. 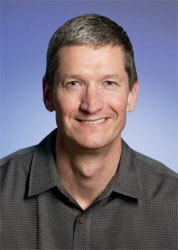 Cook is expected to introduce the next generation iPhone. Apple’s first high-profile announcement since WWDC and Cook’s first as CEO. The future (although maybe just short term) of Apples stock price rests firmly in his hands. Cook is highly regarded as an expert in operations and supply chain management. He is given credit as the man who secured an ample and inexpensive supply of internal components for the iPod, iPhone and iPad. Tomorrow will be a test of whether he can move beyond that role and deliver a dynamic and exciting keynote. Cook will likely be joined by Phil Schiller and Scott Forstall, but Steve Jobs is not expected to make an appearance. Nervousness aside, Cook should do a fine job introducing one of the most highly anticipated products of 2011.